Students of the Correia Instrumental Music Department participate in a variety of education outreach including workshops, festivals and competitions. Read below for a description of our 2017-18 outreach schedule. Our Advanced students will be going to disneyland to participate in the Music Soundtrack Workshop. This workshop takes students "behind the scenes" of Disneyland where students will learn about the field of sound recording arts. Led by an experienced Disney entertainment professional, students explore the process of attraction scoring and storytelling through music. Students will be given free time to explore the park and further analyze how music enhances the attractions in the park. While no student will be denied participation, we are asking that students contribute $160.00 to help cover the expenses for this field trip. This includes transportation (school bus), Disneyland tickets, workshop costs, and a $10.00 stipend for food. Students in Advanced Band, Jazz Ensemble, and Orchestra will attend the 2019 Forum Festival held in Fullerton California to compete at this national music festival. At this adjudicated festival students will be performing in the morning and then celebrating their success at Knotts Berry Farm in the afternoon. While no student will be denied participation, we are asking that students contribute $125.00 to help cover the expenses for this field trip. This includes transportation (school bus), Knotts Berry Farm tickets, festival registration costs, pizza, and a $10.00 stipend for food. Students in Guitar, Choir, and Beginning Band will attend the 2019 Forum Festival held in Fullerton California to compete at this national music festival. 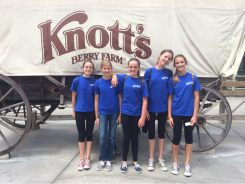 At this adjudicated festival students will be performing in the morning and then celebrating their success at Knotts Berry Farm in the afternoon.